With age photos yellow, crack and deteriorate and before you realize it, your most treasured memories have faded. Let us put them on CD for you to preserve them for your lasting enjoyment. 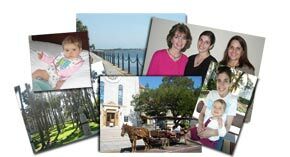 Our Deluxe photo package will take your photos and scan them in at 2400 dpi. These photos will then be put onto CDs to make them last. The package also includes basic editing of up to 6 pictures. With this package you will receive two CDs. The first CD is a Photo CD that will play in most home DVD players. The second CD contains high-resolution copies of each photos in addition to, email-friendly copies of each photo. Emailable copies are small enough to send through the internet without filling up your family/friend's inbox.